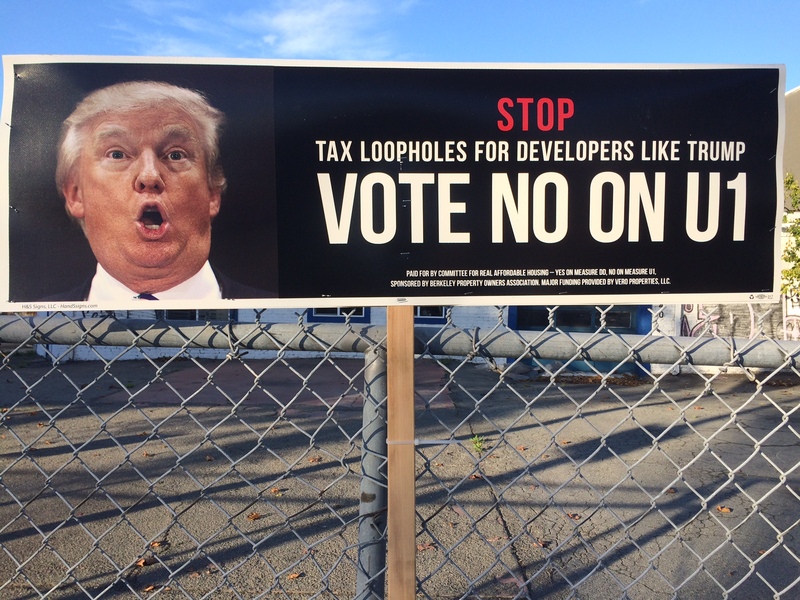 Home › Issues › Tenants Win Berkeley Elections! BPOA spent $1 Million – and lost! Like progressives all over America, Berkeley voters are sad, angry and frightened about the national election results. However, we have a lot to celebrate at home, and can look forward to once again leading these United States in progressive, humane, and innovative solutions, particularly to the problem of ensuring safe and affordable homes for all. The big landlords who control about 50% of all rental housing in Berkeley spent about a million dollars to defeat the affordable housing tax Measure U1, and promote their deceptive Measure DD. That is well over $15 per voter! Yet Berkeley voters reaffirmed affordable housing as a core Berkeley value with 75% voting for U1 and 71% voting against DD. This tax on large landlords is expected to generate $4 million annually in new revenue for affordable housing and homelessness prevention programs!! East Palo Alto also passed a similar landlord tax, and it is hoped this will be a model to take back profits being drained out of our communities and use them to build homes. Additionally, Berkeley supported stronger protections for families being evicted for owners to move in. Measure AA, which passed with an astounding 73% of the vote, was put on the ballot at the request of the Rent Board. ProRenter candidates also got strong support from Berkeley. Renter Cheryl Davila beat incumbent Darryl Moore in District 2 despite generous spending by the Association of Realtors for Moore. BTU Members Ben Bartlett and Sophie Hahn were also elected to the City Council, and BTU Member Jesse Arreguin was elected as Mayor! Perhaps the best news of all for tenants is that landlord incumbent Judy Hunt was voted off the Rent Board, with the “CALI Slate” chosen at the 2016 Tenant Convention easily defeating Hunt’s tiny team. Elsewhere in the Bay Area, California gained its first new rent control in decades, and even in places like Alameda, where the tenant measure was defeated, renters did gain new protections on November 8. Soon the new City Council will move forward on core BTU issues like Short Term Rentals and mitigations for Demolition of Rent Controlled Units. BTU will work to guide our new leaders, who we hope will be more responsive to what everyday folks need in order to keep Berkeley a place we can all call home. “Berkeley voters approved a landlord tax that will raise millions for affordable housing. “Sophie Hahn handily won the District 5 council seat being vacated by Capitelli, defeating another candidate with real estate industry backing, Stephen Murphy, 61.9 percent to 38.1 percent. Hahn is a member of the Zoning Adjustments Board. Capitelli endorsed Murphy, his appointee to the Planning Commission and the panel’s current chairman. “Measure L in Richmond, which would enact limits on rent increases and landlord evictions, was victorious with 64 percent of the votes cast. In Oakland, with all 279 precincts reporting, 74 percent of voters supported Measure JJ, which requires landlords to get permission from the rent board before increasing rents above the consumer price index and expands eviction protections. In Mountain View, Measure V, which was placed on the ballot by voters, had a slim victory with 53 percent, while W, the council-backed measure fell short with 49 percent.